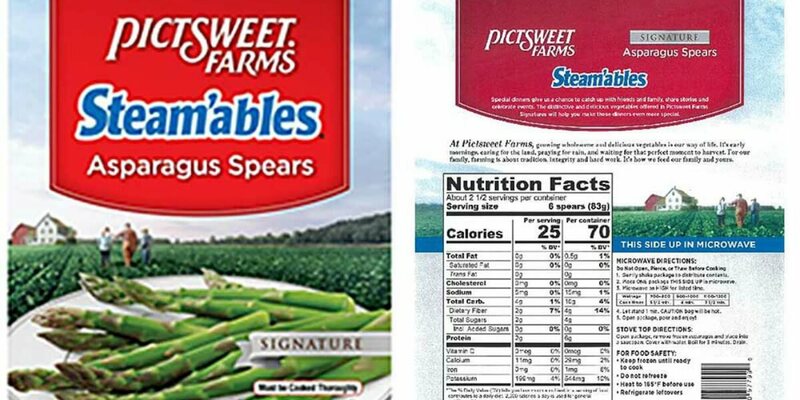 Pictsweet Company recalled 1,872 cases of Pictsweet Farms 8 ounce Steam’ables Asparagus Spears due to the potential of Listeria Monocytogenes. Listeria monocytogenes is an organism which can cause serious and sometimes fatal infections in young children, frail or elderly people, and others with weakened immune systems. Healthy individuals may suffer only short-term symptoms such as high fever, severe headache, stiffness, nausea, abdominal pain and diarrhea. Listeria infection can cause miscarriages and stillbirths among pregnant women. No illnesses have been reported to date and no other Pictsweet Farms products are impacted. Alabama, Arkansas, Connecticut, Delaware, Florida, Georgia, Illinois, Indiana, Iowa, Kentucky, Louisiana, Maine, Maryland, Massachusetts, Michigan, Minnesota, Mississippi, Missouri, New Hampshire, New Jersey, New Mexico, New York, North Carolina, Ohio, Oklahoma, Pennsylvania, Rhode Island, South Carolina, Tennessee, Texas, Vermont, Virginia, West Virginia, Wisconsin and the Commonwealth of Puerto Rico. The recall affects only Pictsweet Farms 8-ounce Steam’ables Asparagus Spears identified by UPC code 0 70560 97799 9 with production codes beginning with the following six digits: 2138XD and a “BEST BY AUG 1, 2020.” This will be printed on the back of each package. Consumers who have purchased this product should contact Pictsweet consumer affairs line at 1-800-527-0986 from 9am to 5pm Central Standard Time, Monday – Friday or return the product to the place of purchase for a full refund. Sara Lee Cheesecake Slices only $0.69 at Stop & Shop!